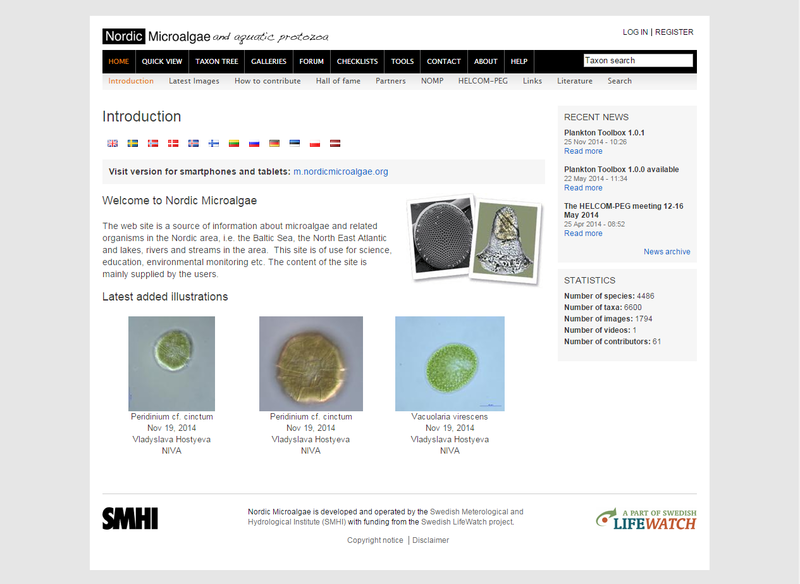 The Nordic Microalgae website is a source of information about microalgae and related organisms in the Nordic area, i.e. the Baltic Sea, the North East Atlantic and lakes, rivers and streams in the area. This site is of use for science, education, environmental monitoring, etc. The website offers a quick view, a taxon tree, several galleries with collections of images, a forum, Nordic Microalgae checklists and tools. Nordic Microalgae is developed and operated by the Swedish Meterological and Hydrological Institute (SMHI) with funding from the Swedish LifeWatch project. The content of the site is mainly supplied by the users.